Exhibition open, competition entered, exhale! The exhibition opening went really well, there must have have been 50+ people there, sold a few prints but more importantly, the feedback was really positive. The images looked great printed on handmade art paper and cotton rag canvas and this added to their painterly quality. Many people were to surprised to discover that they were actually photographs and I think that gave my “found painting” concept some resonance. and see some really interesting work by other photographers. Remember, you can still go in the draw to win a limited edition print if you subscribe to this blog whilst the exhibition is on (until the end of June). All you have to do is click “subscribe” on the bottom lefthand side of this post. Image of the week: This boat image is a little different from the others in that it’s more obvious that it’s a boat. It was shot in Newlyn Harbour back in 2007 and I was strangely drawn to it’s lack of colour. 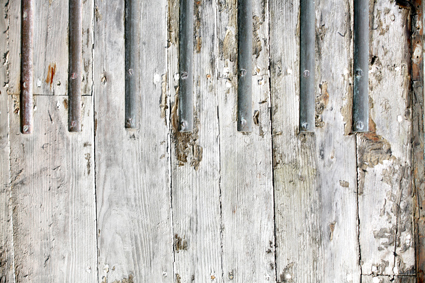 The metal bands reinforcing the wooden planks reminds me of the black keys on a piano and gives the image a certain musicality. Record Of The Week coming soon ………….